First things first: this wildly original cheese that you most likely haven’t heard of is actually called juustoleipa and is pronounced hoo-stah-lee-pa in its native Scandinavia. It’s also commonly referred to as “bread cheese,” because of its light crust that’s, well, similar to toasted bread. Bread cheese was originally made from reindeer milk in northern Finland and Sweden. For real! Cows are slightly more common in Wisconsin, so we make this squeaky, buttery, slightly caramelized cheese from cow’s milk. Because juustoleipa has such low acidity, it doesn’t melt when heated. It just beautifully softens, so we love to bake or fry this conversation starter on a griddle, and serve it soft and slightly browned with honey, fruit and tasty brown breads. Long storing and heat-loving juustoleipä is really fun to have around in the summer for big summer salads and grilled skewers or wherever you need a fun cheese to start a great conversation. In Scandinavia, bread cheese is often served as a dipper in hot coffee. To each their own, but in Wisconsin we like to pair it with crisp and cold lagers and pilsners or chilled whites on the sweeter end of the spectrum like riesling, grüner veltliner, pinot gris or viognier. 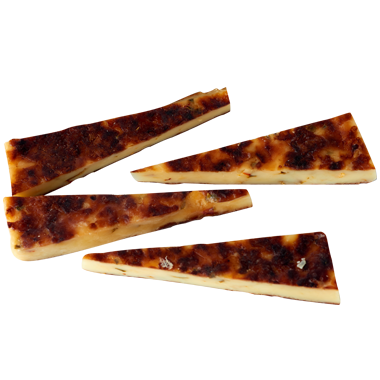 Bake it, griddle it, grill it, or pop it in a toaster oven— juustoleipä is really fun to heat because it softens but cannot melt. We love to throw it onto veggie skewers and grill it up in the summer. It’s also really yummy at room temperature, cubed and in almost any kind of salad.